NetSpot is a free WiFi analysis and troubleshooting app that can really help you assess and boost your wireless network at home or in the office. 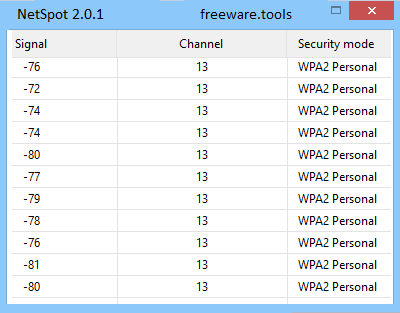 With NetSpot for Windows it's easy to scan all Wi-Fi networks in range and collect their detailed profiles. Every single specification of surrounding wireless networks gets on your screen in seconds after running NetSpot's Discover mode. With the Survey functionality one can quickly visualize any area and get an interactive heatmap of wireless signal level. You just need an area map, and a laptop or Windows-based tablet to build an expert-level visual Wi-Fi reports. These real-life heatmaps quickly locate dead zones and a lot more. If you want to set up your wireless network, you need to take into consideration a series of parameters, which might have a strong impact on its overall accessibility. However, instead of measuring signals and analyzing data manually, you can turn to third-party software solutions, such as NetSpot, which can yield quicker and more efficient results. Please be aware that this program requires you to have a wireless adapter so that it can function on your computer properly. Setting up this application on your computer can be easily accomplished by launching the installation package and clicking the Install button. No additional configuration is required on your part, not even specifying the target directory. NetSpot features a smooth, user-friendly interface that encompasses multiple functions, which you can easily access if you have medium to advanced PC skills and understand certain wireless networking-related concepts. This program enables you to detect WiFi hotspots nearby and also provides you with a series of helpful details about them, such as signal strength, band, channel, width, vendor and security. Additionally, selecting an access point and clicking the Details button provides you with even more insight. This feature makes it possible that you can view signal graphs, tabular data and various frequency-related values. More so, you can use this tool if you need to start wireless surveys, in order to enhance the efficiency of your network. You just need to click the Survey button and create a new project, or open one that you previously saved on your computer. Doing so requires you to type a name in the designated box and specify a survey map source by loading an existing one, using a sample area map or loading a blank one. After defining all the required parameters, you need to choose two points on the map and let the utility scan for nearby hotspots. This can help you improve your wireless network's efficiency by displaying signal distribution, range and other useful details. As a conclusion, NetSpot is a powerful tool that can help you enhance the efficiency of your wireless network by offering you a broad range of useful information. You can detect nearby access points, view signal and frequency-related information or create hotspot surveys by using various map sources. Its intuitive, handy functions along with the user-friendly interface it integrates make it a reliable asset.